Well, of course, Massachusetts Governor Deval Patrick should pick former Congressman Barney Frank to fill the US Senate vacancy that will be created when John Kerry is confirmed as the nation’s sixty-eighth Secretary of State. In the absence of the reform that is needed—a requirement that all senators be elected—governors are going to pick interim senators. The Massachusetts system is actually better than in most states; when a seat comes vacant the appointee only serves for three or four months before a new senator is selected in a special election. The question with regard to the interim senator, then, is whether the state will be represented by a placeholder or someone who can actually make an immediate and significant contribution. There are several prospects for the Massachusetts seat who would be good senators. Some have even suggested former Massachusetts Governor Mike Dukakis, the 1988 Democratic nominee for president, although Dukakis says he does not want the position. Just days ago having finished serving thirty-two years as one of the most outspoken and engaged members of the US House of Representatives, he’s actively campaigning for appointment to Kerry’s seat. And he's attracted significant support for the effort, including an "Appoint Barney Frank to the Senate" campaign by the Progressive Change Campaign Committee, a group that played a pivotal role in getting Elizabeth Warren into the race for the other Senate seat from Massachusetts — and getting her elected. Frank makes the best case for his selection, arguing that his experience as a former chairman of and ranking Democrat on the House Financial Services Committee makes him uniquely qualified to serve during a period when —because the “Fiscal Cliff” deal has set up huge fights over everything from raising the debt ceiling to sequester cuts—the focus of the Congress will be on issues on which he’s something of an expert. I have not always agreed with Frank on the question of how best to regulate financial institutions; to my view, the banking reforms he helped to develop were tepid and I agreed with Wisconsin Senator Russ Feingold’s objections that they did not protect against the threat posed by so-called “too-big-to-fail” banks. But Frank was a serious player during the wrangling that followed the Wall Street meltdown and bailouts of 2008, and he gets high marks from no less a figure than US Senator Elizabeth Warren, D-Massachusetts. Warren’s words are worth considering. 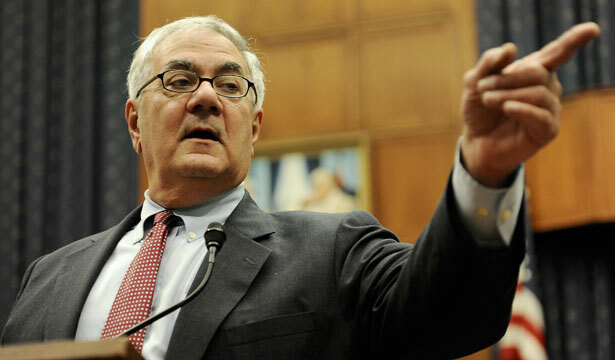 But there’s a stronger argument for putting Barney Frank in the Senate at this time. He is one of the most ardent and consistent advocates for cutting the Department of Defense budget. And it is hard to imagine how Congress gets beyond the current wrangling over debts and deficits without addressing what President Obama’s designee for Secretary of Defense—former Nebraska Senator Chuck Hagel—refers to as a “bloated” Pentagon budget. Even some top Republicans, such as Oklahoma Senator Tom Coburn and Kentucky Senator Rand Paul, agree. They say the DoD budget must be “on the table.” And, as part of the sequester scheme, it is, in fact, there. But the military-industrial complex has teams of lobbyists—including more than a few former members of Congress —who are at the ready to defend the bloat. And even to expand it. The president’s nomination of Hagel to serve as Secretary of Defense suggests that the White House may be ready to propose cuts. But they will need strong allies on Capitol Hill. And a Senator Barney Frank would be just that. Frank has the confidence to make that case in Congress. For more on early-term appointments and defense policy, read John Nichols’s take on Chuck Hagel.